Why can I select specific songs to play on Free Spotify for tablet and not on Free Spotify for mobile ? 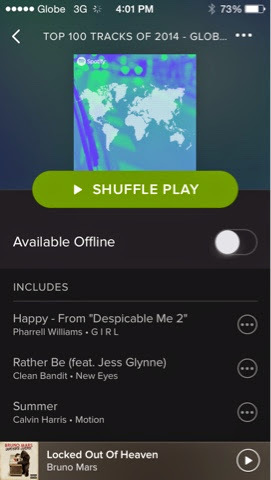 Anybody else here who noticed that even on free accounts, one can choose the specific song (from each playlist)you want to play on a tablet compared to when using spotify on mobile phones? Look at my iPad's screenshot above, you can see that the songs are displayed in white. They can be tapped and played. You can play the songs you want without using up all the "skips" available for free accounts. Where as on my iPhone's spotify (using the same account), you can see that the songs are in gray and can't be tapped. What you can do instead is play the whole playlist in shuffle mode and use next track/skip tracked and hope that the song you want to play will be next on the queue before using up all the free skips. At first inthought it was a bug, but i decided to search for clues or information if spotify for tablets are intended to behave that way. "on mobile, you can listen to artists, albums, and playlist in shuffle mode. On your tablet, you can play any song you want, anytime you like." If I understand correctly, this explains why we are allowed to play specific songs on our tablets. 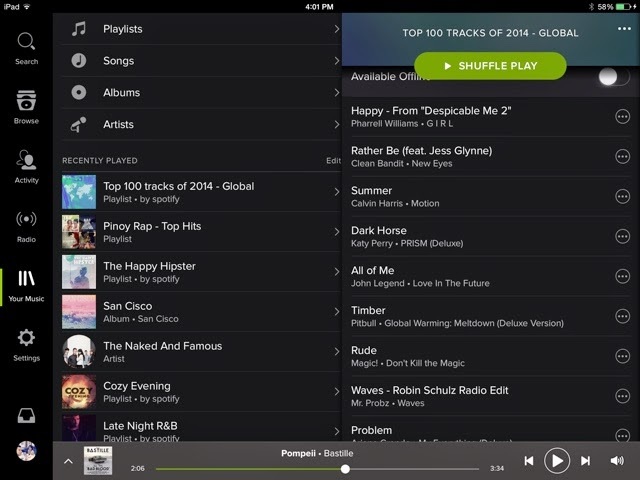 This means spotify for tablet are better to than the mobile version. The same reason why as much as possible, i use my tablet for spotify.